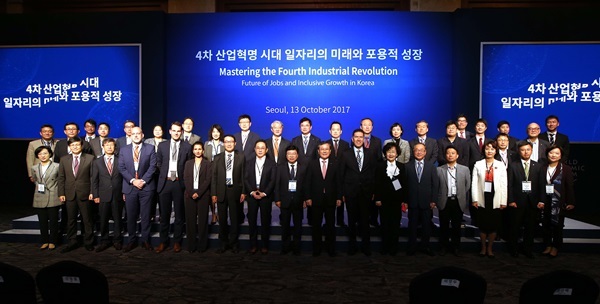 On October 13, KAIST and the World Economic Forum held a roundtable meeting on the fourth industrial revolution at Lotte Hotel in Seoul. The roundtable meeting on the fourth industrial revolution, jointly organized by KAIST and the World Economic Forum, was held in Korea for the first time. The event was attended by representatives of the National Assembly’s Fourth Industrial Revolution Forum, such as Song Hee-kyung, assemblywoman for the Liberty Korea Party, and Shin Yong-hyeon, assemblyman for the People’s Party, and government officials from the Ministry of Science and ICT, Ministry of SMEs and Startups, and the Fourth Industrial Revolution Committee. Six members from the Geneva headquarters of the World Economic Forum were present at the event, including Murat Sonmez, the head of the Center for the Fourth Industrial Revolution, and Sebastian Buckup, the head of programming. Members of KAIST who attended the event were Lee Jang-moo, the Chairman of the Board of Trustees, President Shin Sung-chul, Park Hee-kyung, the Vice President of Research, and Lee Sang Yup, the Dean of KAIST Institutes and Director of the Fourth Industrial Revolution Information Center. The topics covered during the meeting were: ▲ Future jobs ▲ creation of innovative ecosystems, and ▲ SME 4.0 initiative. 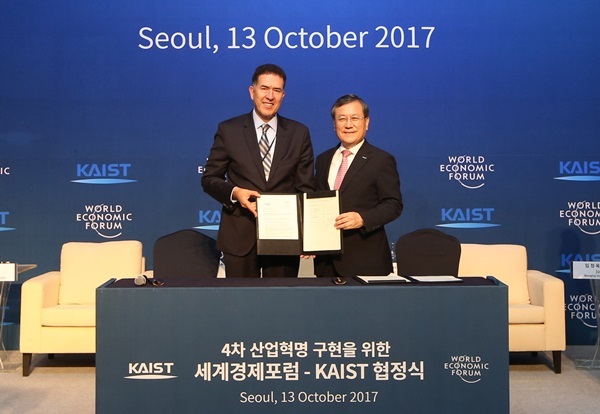 On this day, KAIST and WEF signed a memorandum of understanding to boost collaboration concerning the fourth industrial revolution. Under the new MOU, KAIST expects to play a leading role in building Korea’s global presence in the age of the fourth industrial revolution. WEF’s Center for the Fourth Industrial Revolution, and Shin Sung-chul (right), the president of KAIST, post after the signing.